I was born and raised in the Appalachian mountains of East Tennessee. 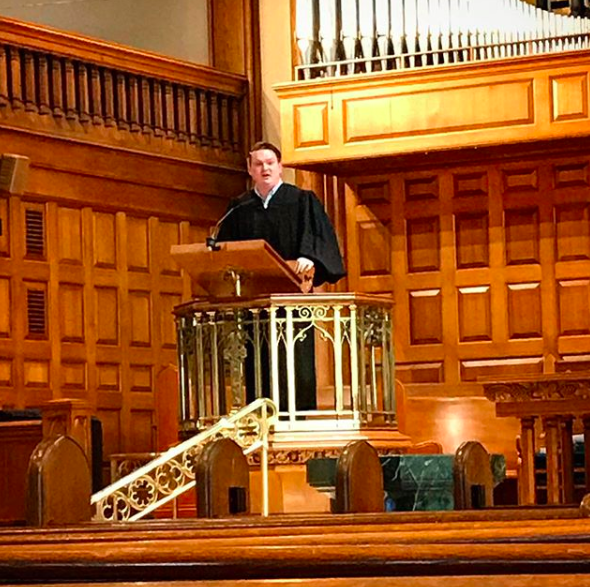 In 2016, I graduated from Union Theological Seminary in the City of New York with an M.Div and was ordained as Executive Director and Minister of the Urban Outreach Center at Jan Hus Presbyterian Church on the Upper East Side of Manhattan. The UOCNYC is a human services nonprofit that serves nearly 30,000 food- and housing-insecure New Yorkers each year. I’m passionate about innovative nonprofit leadership; tech and human-centered design in the nonprofit sector; and activism for social justice, particularly organizing around issues of hunger and homelessness. In my ministry, I am passionate about relational practices of pastoral care, as well as preaching and teaching a Reformed theological lens on the Bible and our world, bringing together diverse groups of folks in meaningful community as a vehicle to work with God toward a vision of justice for all people and to transform lives in the love of Jesus Christ. When I’m not doing churchy things, I like hanging out with my fiancé, Mary, exploring mountains, Tennessee Volunteers football, jazz guitar, cheap Chinese food, reading the New Yorker, an occasional bourbon, and planning the next time I can take a nap. You can pretty much always find me on Twitter @JordanTarwater. I have yet to find a proper glass of sweet tea in New York City.